This past Saturday the boyfirend and I had a great dinner at Juno in Chicago. Courtney of my bosses. They are the best! The weather here in Chicago has been very crazy! One day we are in the 70's and now we can't even get above 40! The warm weather had me so excited for Spring. So I grabbed my photographer and we headed to shoot! I drive past this mural a ton and thought why not shoot here? Full of color and life. Perfect for Spring! and at $59 bucks why not grab yourself one. Comes in 5 colors and I quickly want to add the navy one to my collection. 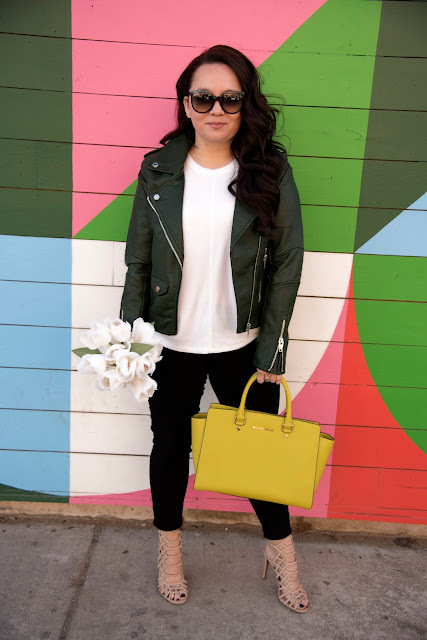 Oh my gosh, I'm obsessed with how cute & springy your outfit is! It's the same way in NY, it was so warm, but it's getting cold again, but I don't care. In my mind it's spring already! Lol! Girl I know Mother Nature must be really going through some tough stuff!! Hahaha SPRING is all on my mind! Sometimes all you need is a pop of color, especially with a neutral outfit. Yellow is one of my favorite colors to pop in. Wow such a great cause and some hilarious tees. Having a support system is so critical in these times. The weather in Napa Valley has been crazy like that as well! I'm so ready for spring so I can wear more outfits like this one without a need to layer too much! Right!! 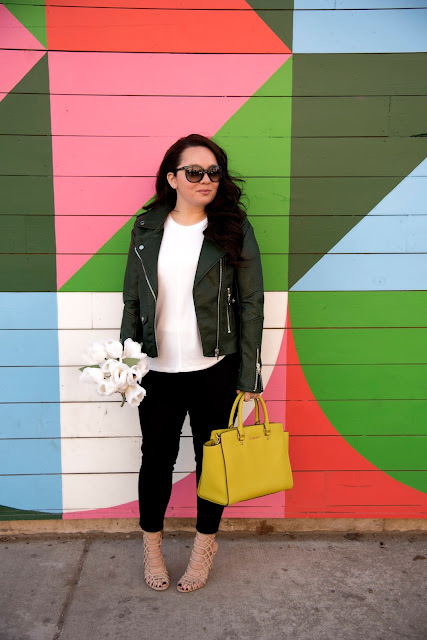 I love that all you needed was a light jacket :) Perfect for this type of weather!! Bring on Spring! The wall is so cool and I love this look! I've always wanted to try Juno! I live a couple blocks from it! 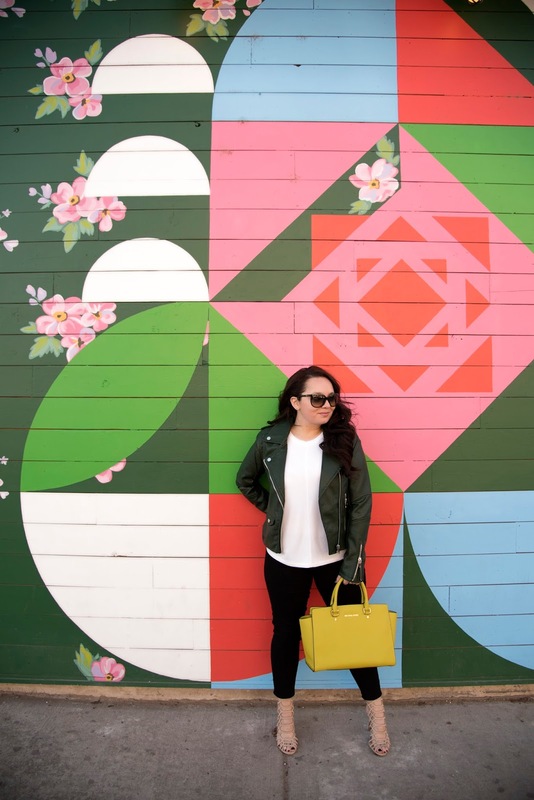 This wall is a great find! OMG!! GIRL GO!!!!! Like make a reservation and go now!! That wall art is so fun! Love the jacket! Love these photos and the outfit! Yes!!! OMG what?! I wish mine were from Target I paid a little too much for these babies.. face palm!! 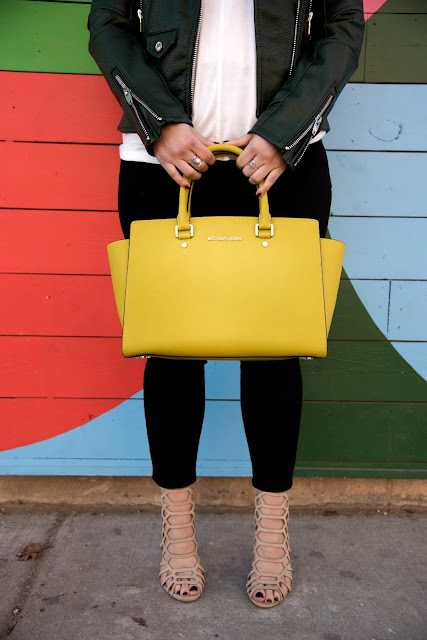 This yellow bag is such a great pop of color, love it! 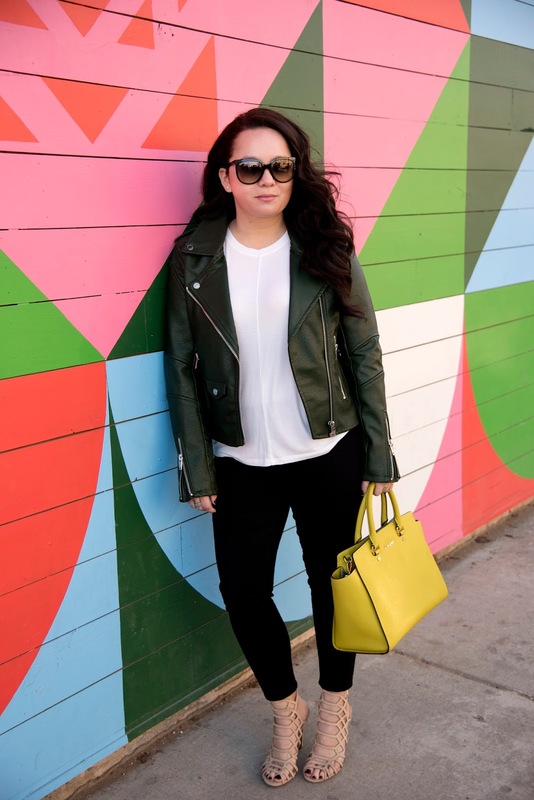 I missed where this jacket is from but if it's faux leather from Nordstrom then I have the same one! You look so cute! Love your moto jacket and such a fun wall! Samantha! Thanks lady :) I love this wall!! That jacket and bag combo is amaaaaazing! Such an amazing look. Love the surroundings. Your biker jacket over white tee and jeans look really good, the addition of bright bag is a plus. Thanks lady! 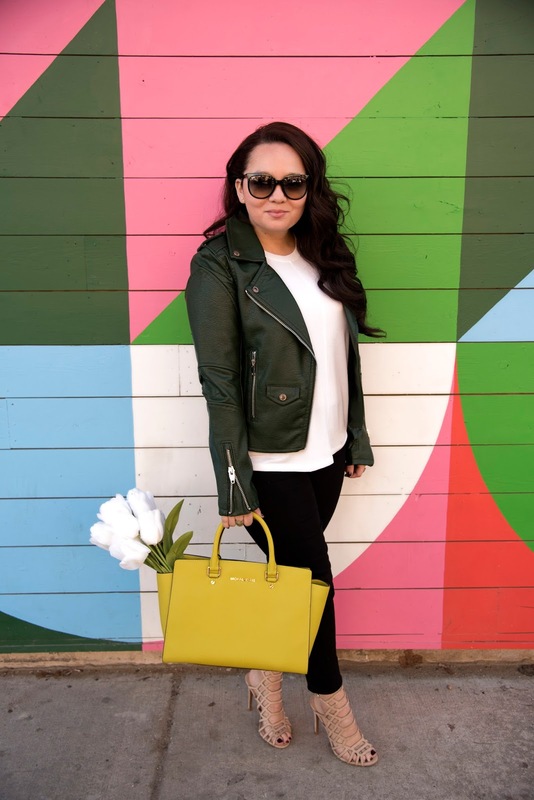 I love something basic with a fun bag or accessory! 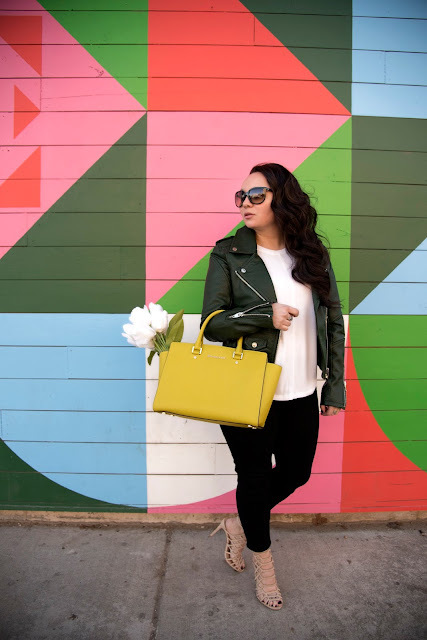 I love the pop of color in your bright purse and the way you found such a vibrant photo backdrop! Plus you and your bf having great sushi sounds like an awesome time!!! Danielle, Thanks so much! I saw this backdrop and was like I have the perfect moto jacket for this mural. Also good sushi is always a win!! 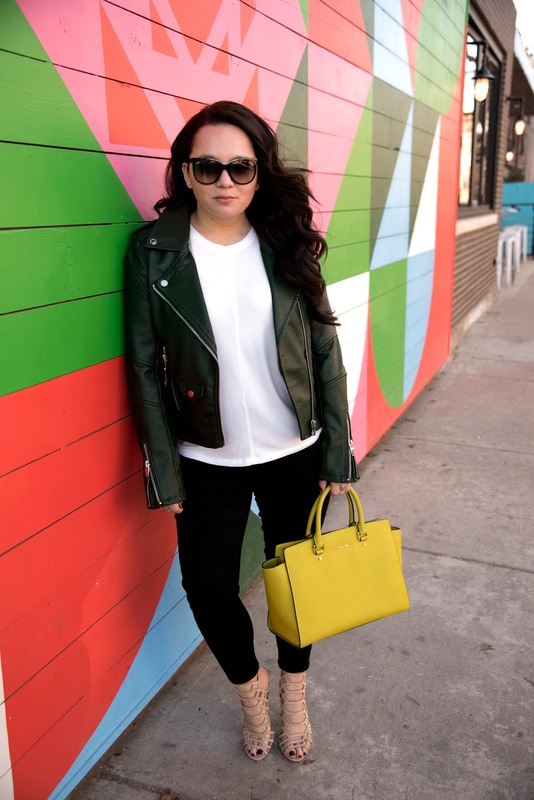 This color palette is so good and I love your yellow bag! 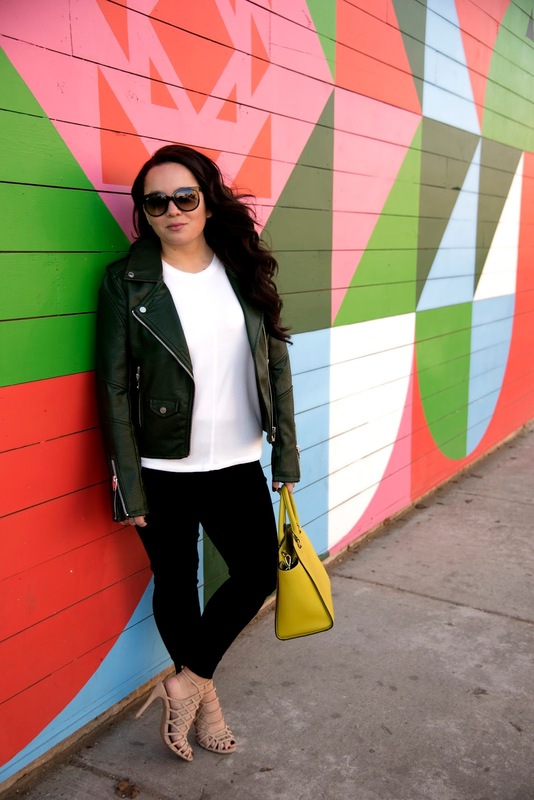 Your jacket is so perfect for transitioning into spring! Tina!! Right :) I love this jacket and can't wait to wear it more often in the Spring! xoxoxo thanks lady :) && I love that backdrop!! Gorgeous!! Seriously cannot wait for Spring! OMG!! I know lady!! Spring come fast!! Could you look any cuter?! Oh my gosh obsessed with your look! Please tell me those are the heels I just found at Target last week. Because I'm obsessed with that style and they look amazing on you. This whole look is actually perfect. I love shooting neutral looks with a pop of a background. It really lets both the look and the art stand out. I hope you stopped in for some food after! That place is delish.